The easy-to-read display was a key feature that sold me on Oxo's digital thermometer. I’ve got a couple of different thermometers that I use in the kitchen, each for different purposes. My candy thermometer is great for high-temperature work (boiling sugar for making things like marshmallows and macarons), and my little dial thermometer adequately handles lighter duties like checking baking temperatures. The downside with both is that they take a long time to reach an accurate measurement, and they’re hard to read while frantically whipping something up in the kitchen. 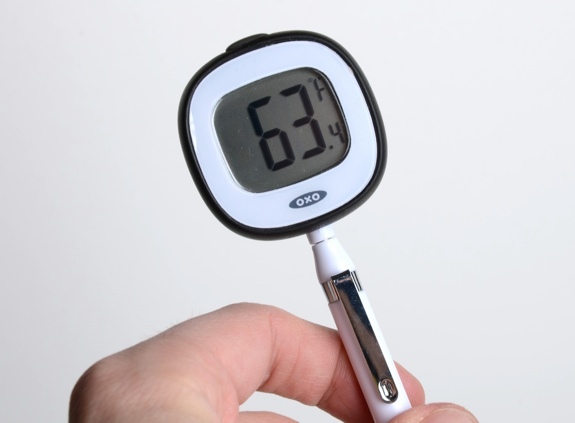 And so the allure of this Oxo digital thermometer — giant numbers, reads temperatures quickly — was easy to grasp. It’s great for baking. I use it to check water temperatures when I’m proofing yeast, as well as for checking the temperatures of other liquids I’m adding to a batter or dough. Also good for checking air temperature in the spot where I want to leave a loaf of bread to rise. The temperature readings really are quick and easy. It’s idiot-proof. There’s an on/off button, and a Celsius/Fahrenheit button. That’s it. You don’t need a manual to operate it. The centre of gravity on the head of the thermometer is not well balanced at all. When standing up at an angle in a cup or bowl, it wants to spin around, obscuring the readout screen. You have to hold it or find a way to prop it up for it to be useful. I tried using it to make marshmallows, which requires precise measurement of boiling sugar temperatures. While it seemed fine at providing temperature readings, it was a pain to hold up in the boiling sugar. I quickly switched back to my glass candy thermometer (with clip) so I wouldn’t burn myself. I don’t cook a lot of meat, but the probe has a sharp point that should easily work its way into a slab of meat to check the internal temperature. 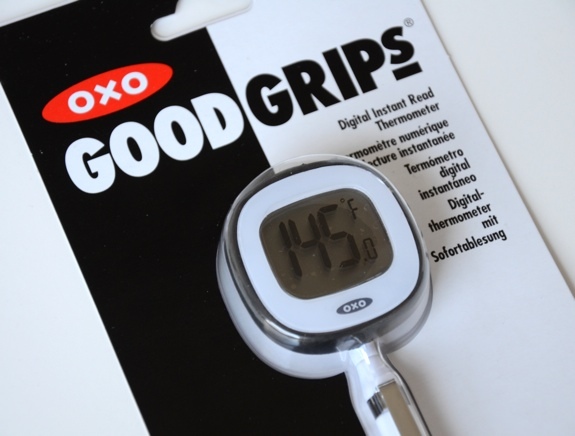 An Oxo digital thermometer, still in the easy-to-spot package. Cost: $21.95 at Call the Kettle Black, a kitchen shop in Edmonton. Value for cash money: Not bad. Seems well built, so I expect it to last me for years. Availability: Kitchen shops, department store kitchen sections. Temperature range: From -40 to 302 Fahrenheit (-40 to 150 Celsius). Digital vs. Analogue: Comes down to personal preference. Personally, I like the big digital readout, but I know some people prefer the old-school lines on a glass tube. The verdict: For basic temperature-taking, it’s perfect. I use it all the time when I’m baking or making lattes. I’ve learned its limitations, but I’m still happy with the product. For making candy, look elsewhere. *makes mental note*Oxo digital thermometer-Call The Kettle Black!! *underlines heavily* Thanks Iain, just what I was looking(well, thinking of looking) for. I had bought one of the single cup Aeropress coffee makers & it’ll be reassuring to use water at exactly 170 degrees as opposed to…eh, roughly 170. Excellent! I like knowing the exact temperature of things, instead of just kind of guesstimating. I’ve used it a lot for proofing yeast and other baking tasks. I keep finding new uses for it. Worth the $22, IMHO.